Lens Description: The Lensbaby Composer Special Effects SLR Lens is part of the Lensbaby series of SLR lenses, and offers the same spectacular special-effect results. However, the Composer introduces a completely new design. Based on a ball and socket configuration, this version allows for smoother selective focus control. The Composer will retain its position after being bent, which makes it easy to use even with one hand. Users also no longer have to squeeze the lens to focus. 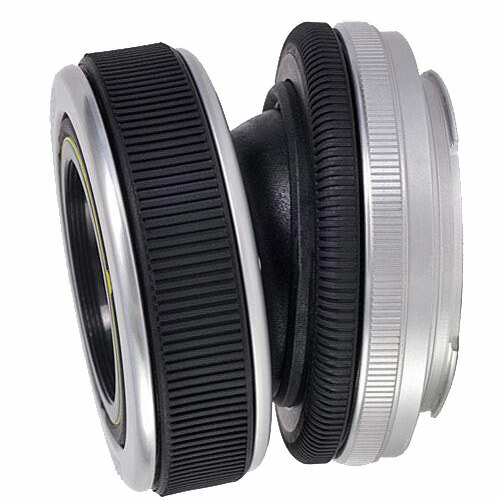 They can simply tilt the lens to a desired angle and then focus with a traditional barrel focusing ring. A Lensbaby lens is a hybrid between a bellows camera and a tilt-shift camera. It allows for selective focusing with SLR cameras. It will bring one area of a photo into sharp focus, surrounded by gradually increasing blur. Effects like blurring, glowing highlights, and subtle, prismatic color distortions can all be achieved without software manipulations. The lens can be bent off-center in any direction for different results.